Download Dr. Roberts’ business guide to Botulinum Toxin. Can discuss and treat all aesthetic patient concerns regarding their teeth, smile and face. Dr. Roberts discusses the importance of dental health practitioners opening their minds and beginning to understand how botulinum toxin fits into the diagnostic and treatment armamentarium, thereby improving the well-being of our patients. There are no long-term negative side effects associated with botulinum toxin type A, and typically, therapeutic results last 4-6 months and cosmetic results last 3-4 months. The ability to successfully treat all aspects of a cosmetic case, from start to finish, is key to achieving ideal aesthetic results. Dentists need to look beyond simply treating teeth, and look at creating smiles that are in harmony with the entire face. Drs. Roberts have written a number of research articles that have been published in Oral Health, Dentistry Today, the Journal of Cosmetic Dentistry, Spectrum, Teamwork, Just for Canadian Dentists and more. See all articles. Are dentists allowed to do botulinum toxin (aka Dysport®/Botox®) and dermal fillers treatments? We train dentists, physicians and nurses from across the world. It is up to each practitioner to contact their local licensing college to determine whether botulinum toxin and/or dermal fillers is in their scope of practice within their jurisdiction, and for practice guidelines. Are your courses recognized by ADA CERP & AGD PACE? Yes, PTIFA is an ADA CERP and AGD PACE recognized provider. Please review each course page for credit information. I only want to learn the therapeutic use of botulinum toxin. What course do I take? There is significant overlap between aesthetic and therapeutic botulinum toxin treatment. Many practitioners only perform “aesthetic” injections while others only “therapeutic”. A deeper understanding of how the two are related is required in order for you as the practitioner to serve your patient most effectively. In order to provide a high-level of patient care, practitioners require a deep comprehensive understanding of the PTIFA Therapeutic Template and the Cosmetic Template and their synergy. Precise anatomical placement allows assessment of proper dosage. Somewhat higher dosages than those used for aesthetic treatment alone results in reduction of headaches and migraines (Allergan PREEMPT study). A threshold dosage, carefully placed, must be reached in order to obtain therapeutic relief. At this juncture, the secondary and tertiary mechanisms of action of botulinum toxin (Dysport®/Botox®) come into play, and there is a synergy between aesthetic and therapeutic outcomes. That's why our Level 2 course has been designed to teach you the cosmetic use of botulinum toxin in the upper face, as well as the therapeutic use for reducing pain (migraines/headaches/TMJ/bruxing/etc). At a minimum, we recommend the Level 1 online Level 2 hands-on course. To learn more, review Dr. Roberts' article "Botulinum Toxin: Not Just a Pretty Face". How do I engage & train the rest of my dental team? A big part of our educational philosophy is being able to successfully integrate treatment into your office. We understand the challenges of introducing a new treatment modality and so we proudly offer separate and extensive team member training. The Team Member courses are geared to give any auxiliary staff the knowledge and skill to immediately integrate back into your office after completing the course, and to help you provide the highest level of patient care. Nothing will replace the enthusiasm your team members will have who attend the course with you! Do you have a combined botulinum toxin & dermal filler course? Our educational content is thoughtfully created and structured to allow dental and medical graduates to be successful in achieving predictable results - with little to no side effects. To do this, practitioners require a deep understanding of underlying anatomy, as well as a specific treatment and injection practices that provide the highest level of patient care. Both topics of botulinum toxin (Dypsort®/Botox®) and dermal fillers require ample anatomy-based instruction and clinical hands-on practice. It is not possible to obtain the depth of skill needed to be successful at both in a combined botulinum toxin/dermal filler course. I’m an international graduate. Can I take this course? Our courses are available to international dental, medical and nursing gradates. However, some of the treatments include the use of prescription medications (ie: botulinum toxin) and require the ability to prescribe and/or administer prescription medications. Please appreciate we train practitioners from across the world and that regulations vary. Please contact the local licensing college within the jurisdiction you plan to practice for details prior to registering. Am I allowed to do botulinum toxin injections aesthetically in my province/state? Each province/state has different regulations laid out by the dental licensing colleges. Some provinces/states allow both the therapeutic and the aesthetic uses, while some only allow the therapeutic use. Please contact your local licensing college for scope and for guidelines. PTIFA teaches both the therapeutic and aesthetic use of botulinum toxin together in the Level 2 course. As the secondary and tertiary mechanisms of action of botulinum toxin come into play, there is a synergy between aesthetic and therapeutic outcomes. In order to provide a high-level of patient care, practitioners require a deep comprehensive understanding of the PTIFA Therapeutic Template and the Cosmetic Template and their synergy. Is any clinical integration and/or marketing taught in this course? Yes! Practitioners receive clinical integration in the Level 1 and Level 2 course. Additionally, Team Members who attend the Level 2 – Team Member course receive specific training on how to speak to patients about treatment, how to reconstitute and load syringes, supplies, marketing, billing, photography training and much more. How do I integrate botulinum toxin into my practice? Is it different for medical vs. dental practitioners? The Level 1 and Level 2 curriculum has been uniquely developed to help you successfully integrate botulinum toxin treatment into your practice immediately after taking the course. We understand that incorporating a new treatment modality can be challenging. Our Level 2 graduates can expect to receive all of the training, tools and clinical requirements so that they can begin integrating treatment into your office immediately after the course. How much hands-on instruction will I have? Our goal is to maximize the amount of hands-on experience you have so that you are confident offering treatment back in your own practice after the course. At the Level 2 course, you can expect to inject different 10+ patients. This is achieved by sharing patient models amongst all practitioners. This allows you to inject multiple tissue types and cases. I believe that there are procedures being done by our medical colleagues that would be better performed by dentists. No other profession is better trained or better positioned to address the patient’s perioral esthetic concerns than the dentist. Adding Botox® treatments to my scope of services has been a complete success. It has made a positive impact from many different aspects… Profitability: Botox® can be provided quickly and generate significant revenue with relatively how overhead. Ease of Integration: Incorporating Botox® is much easier than it may seem. Treatments can be provided in conjunction with regular dental appointments, quickly and discreetly. Patient Satisfaction: Our clients LOVE having their Botox® treatments done at their dental office, it saves them time and keeps their treatments discreet in an environment they feel comfortable in and trust. Especially true when the Doctor and the Team have the knowledge and hands-on experience they receive with PTIFA. Fun Factor: This is perhaps the biggest payoff for my team and I. Botox® gets people excited, and when people get excited they have fun. It definitely brightens our day and its a nice change to have patients come in and actually be excited to be in our dental office. Absolute WIN – WIN. PTIFA has been very instrumental in our success, the training was superb. The hands-on components were so important, not only for me to become confident but also for my team to become confident in me as well. I feel that through my training with PTIFA and my participation in the Botox® Study Club I have established a solid understanding of Botox® and all it’s indications. I know what to expect, and I know how to manage a patients expectations and any concerns they may have. I would recommend PTIFA and its programs to any dental team interested in having more fun, offering a higher level of service to their clients, and being more profitable. PTIFA course is most comprehensive. From the online module to the hands-on sessions, the attendees will gain an in depth knowledge of Botox and its variety of indications. Drs. Roberts and their team are absolutely wonderful. They have the gift of being able to convey their knowledge in a very easy to understand manner. A definite must for anyone who plans on using Botox for therapeutic or esthetic purposes. Increase practice income from patients who are prepared to pay privately out of pocket for treatments. Ability to exercise your own creativity by helping patients achieve the appearance they desire. Offer a treatment and service that your patients will ASK you and love you for. Ability to treat an entire smile design case from start to finish, including the fine facial lines & wrinkles surrounding it. Reduce headaches/migraines/TMD without the use of a dental splint. Improve the lives of your patients with proven threshold dosage levels of botulinum toxin. Engage & motivate your entire dental team with botulinum toxin treatment with the Level 2 - Team Training course. Boost chair production by simply incorporating a tray system and adding a 15 minute treatment onto the end of a hygiene appointment. Improved patient care with a deep understanding of how botulinum toxin fits into your diagnostic and treatment armamentarium, and thereby improving the well-being of your patients. According to the American Academy of Plastic Surgeons 2017 Plastic Surgery Statistics report, botulinum toxin (ie: Dysport®/Botox®) procedures has grown over 819% from 2000 to 2017. Are you taking advantage of this expanding market? Learn how you can improve patient care and increase practice revenue with minimal overhead. On average, a new botulinum toxin patient requires 50-70 units of treatment. At $12 per unit, that visit equals $600-$840 in practice revenue. 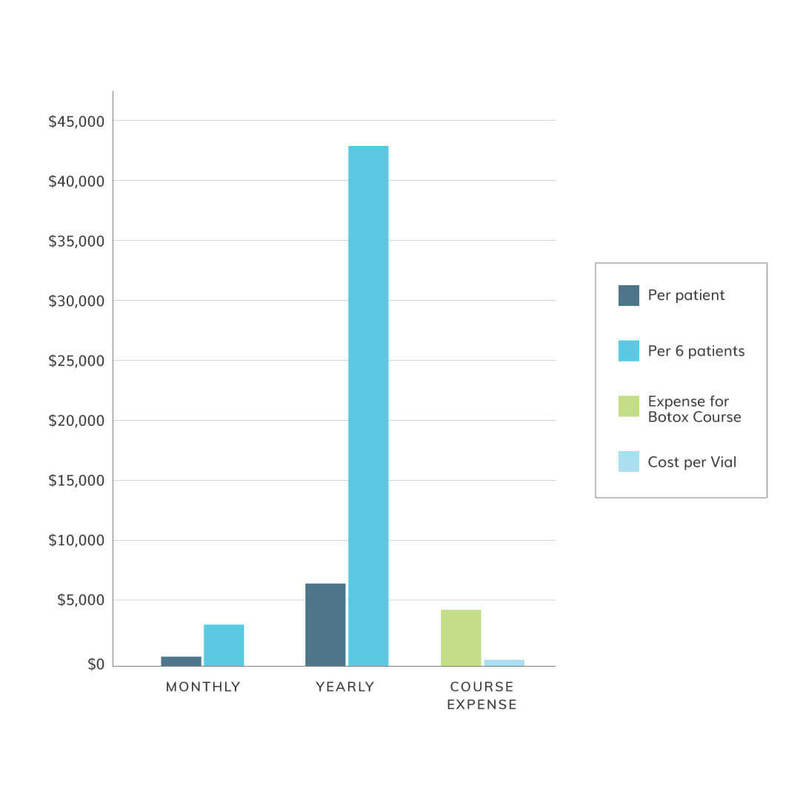 Seeing only six botulinum toxin patients per month produces approximately $3,600 – $5,040 additional revenue per month. In one year, six botulinum toxin patients per month will produce a minimum of $43,200 in practice revenue. 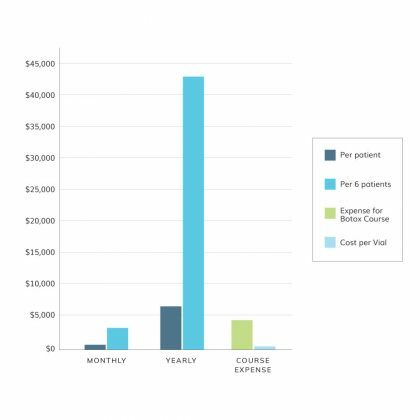 Dentists will see a complete return on their training investment in less than two months (based on seeing six botulinum toxin patients, not including cost of Dysport/Botox® product). Besides ordering product and incorporating a tray system, offering botulinum toxin as a treatment requires no additional equipment or investment. Upon graduating from Level 2, you will be able to offer both the aesthetic treatments for reducing the signs of aging (ie: fine facial lines and wrinkles), as well as the therapeutic treatments (ie: bruxing/clenching/grinding/TMD/migraines/headaches).